I made two burgers with 80 / 20 beef. They were small; on small buns. I like cheese melted on top, with a slice of raw onion and a small burp of ketchup. Funny thing, is the onion, I could not chew. The onions were like rubber. ( A medium Yellow Onion ). Tina said,"They might be just boiling or frying / cooking onions!" bethk wrote: Geeze Louise, what a day! It's been 3 months since I had my hair cut and I finally decided today was the day I had to get it trimmed to shape up the shaggy ends. My neighbor told me she really liked the place she went to so I decided to give them a try. I explained to the stylist I just wanted to shape up the back, I had already trimmed the front and was in the process of letting it grow out. The first thing that made me think I was in trouble was when she combed the hair by my ear and promptly whacked it off.....It went downhill from there. Once the first wrong cut was made I knew there wasn't a thing I could do but let her finish the cut she had started. My hair has never been what I'd call my crowning glory. Straight and baby fine. A couple of years ago I decided to go really short, and have found a great barber that does the best haircut I've ever had. And, as for cooking today, gonna try a pork schnitzel in my little George Foreman grill. And a salad. I have terrible hair: fine, thin. I would get it cut short if I wouldn't look like a goon. I have ears that stick out like Dumbo's. I think the only option I have is a wig. My hair won't curl and breaks with a perm. Right now I just go around in a pony tail. I look like a shrew. It's funny because Katie's hair is just as thin as mine but it is slightly frizzy so it always looks like she has a ton of hair. She has to flat iron it after washing which she is too lazy to do, so she only washes it every couple of months. I can't stand myself if I go three days without washing my hair, never mind two months. But, we have different hair: mine is oily hers is dry. Still, two months LOL. This evening our English friends came for a 'farewell' dinner as they are returning to the UK on Thursday. Judith had promised to show me how to make Yorkshire Pudding and she was 'sweatin' bullets' as she had been told by her friends that no one has been able to make true Yorkshire Pudding in the US because the correct ingredients aren't available. Normally she heats up beef tallow fat in the baking dish but that's not available here, at least neither of us could locate it. But I suggested bacon fat as a substitute and she thought it might work. She was praying they would rise up and cook as they do for her at home so we watched through the oven window and were really excited they cooked just as she had hoped. Personally, I would simply call them a popover that you pour gravy on.....and say they are yummy! 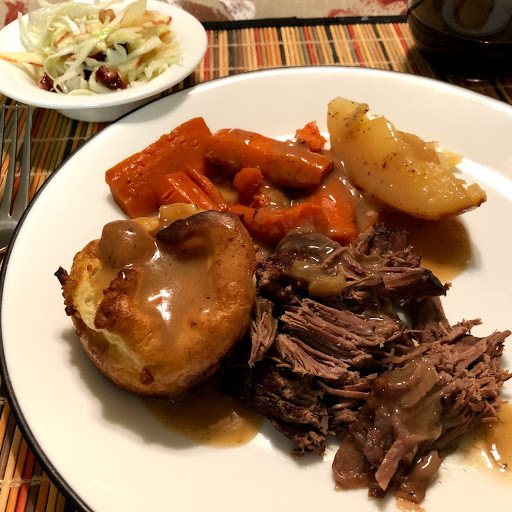 I had made a typical pot roast with carrots & potatoes and then made a rich beef gravy. The meal was pretty tasty. I don't know that I would ever have thought to tear open a popover and pour gravy over it if Judith & Gordon hadn't instructed us to do so. I probably would have slathered them in butter. They were quite tasty. 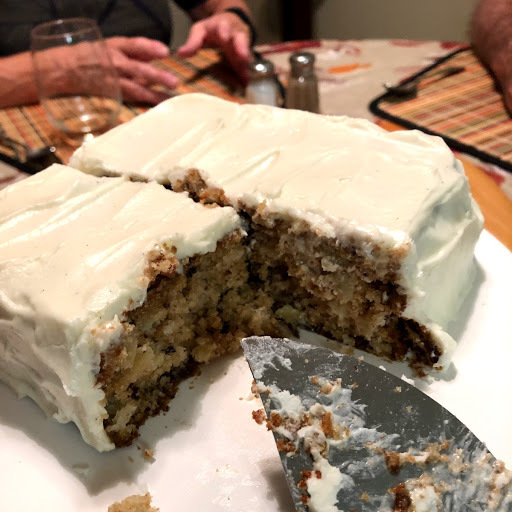 This morning I made that apple cake again ~ I knew I wanted to make a dessert and that seemed like the most American of choices (since I didn't have enough apples to make an entire pie). Had what we call "Mikes Casserole" ....Tina made it! 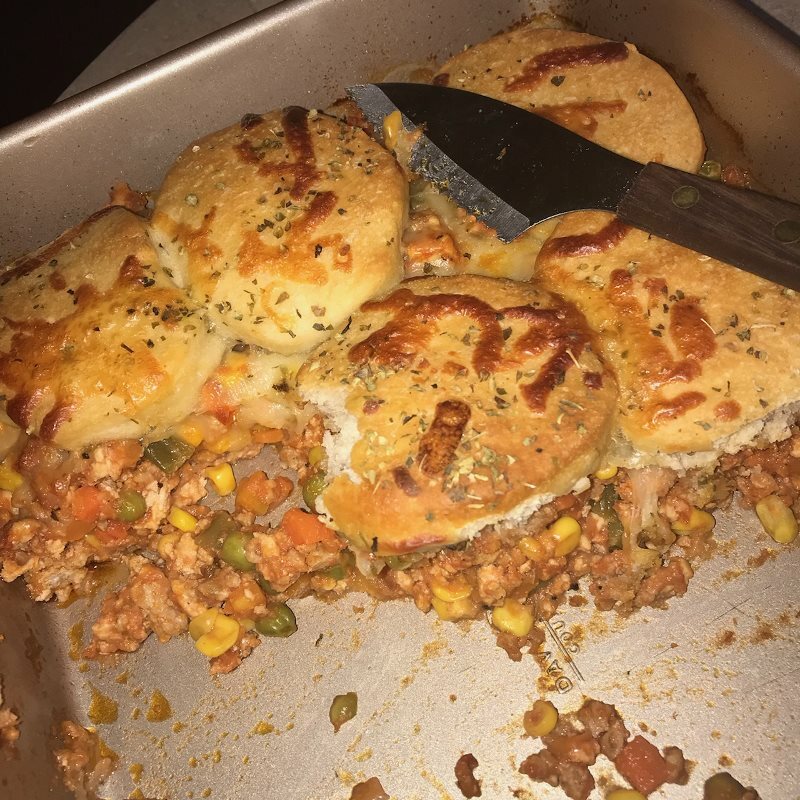 Ground beef, pork, mixed veggies, tomato sauce , cheese and muffins on top. Baked till bubbling. I use the rendered fat from a standing rib roast for Yorkshire pudding. Seems to work just fine. bethk wrote: This evening our English friends came for a 'farewell' dinner as they are returning to the UK on Thursday. Judith had promised to show me how to make Yorkshire Pudding and she was 'sweatin' bullets' as she had been told by her friends that no one has been able to make true Yorkshire Pudding in the US because the correct ingredients aren't available. That beef surely looks great!.... The apple cake too! I remember mom used to make a spiced cake; with an cream cheese icing. I haven't had one in years. Bugster2 wrote: I use the rendered fat from a standing rib roast for Yorkshire pudding. Seems to work just fine. Maybe after our holiday meal (IF we have one this year) I'll remember to save the fat from the beef roast. That would have been the right one to use, although the bacon fat worked fine and I always have a supply in my freezer. 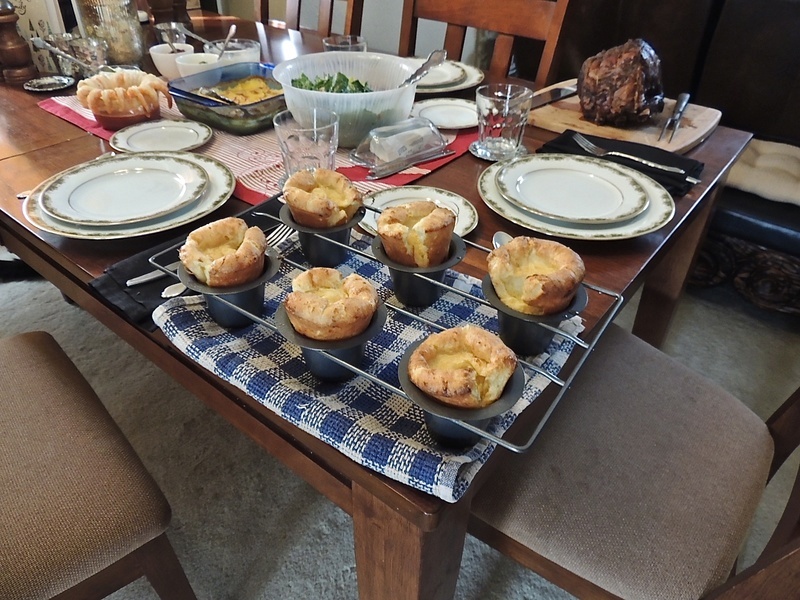 It was interesting to me that the Yorkshire pudding wasn't at all greasy ~ all the fat ended up under the dough when it was cooked through and stayed in the muffin tin. I made those once. I even bought a popover pan for them. The kids didn't think they were anything special but I didn't know about the gravy part. I'll have to try them again sometime. NormM wrote: I made those once. I even bought a popover pan for them. The kids didn't think they were anything special but I didn't know about the gravy part. I'll have to try them again sometime. 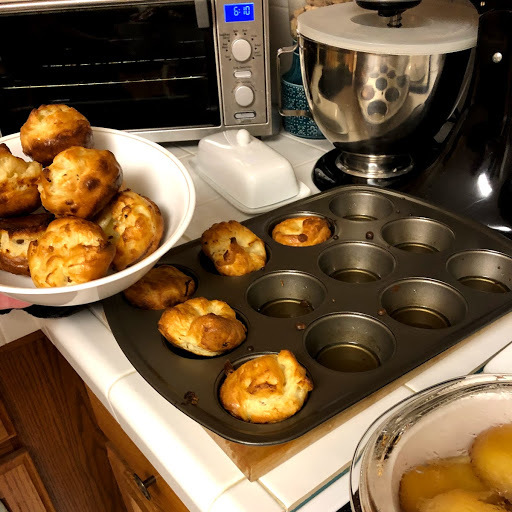 Yes, I was trying to explain what a 'popover' pan was to Judith because she wasn't familiar with it ~ your pic is perfect! But using the muffin tin worked just fine. Judith told me her mother use to make Yorkshire Pudding in a larger tin and had cooked sausages in the tin and then poured in the batter and the sausages were embedded in the 'Puff'....and Gordon, her husband, said at cocktail parties they will sometimes do small pieces of sausages in a mini-muffin tin and they are served as hors d'oeuvres. I would think it would taste much like our 'pigs-in-a-blanket' where you wrap crescent roll dough around the 'little smokey' sausages. Let's face it ~ sausages & dough is always a hit! I made scrambled eggs this morning. I have an odd way of making them: I scramble them with cheese and eat them with ketchup. I don't know anyone else who does this. I just remembered that a local meat shop always had frozen pork and beef fat. I bet you could find some fat at one of those places and render it down and use it for your puds. You're not the only one who likes scrambled eggs like that, Bugs.....my brother has always eaten his like that. Actually, syrup doesn't sound bad. i will have to give that a try. Katie uses taco sauce or salsa on her eggs. I scramble eggs with a little cheese... that is if you consider Velveeta a cheese. Pork Tenderloin and potatoes for roasting are in the oven. I also had two portobello mushrooms so I fried them up. New friend here in the building (she's 92) is going through chemo right now, so I called and asked her to either come up to my place for dinner, or if she preferred, I would bring dinner down to her. She preferred I bring it down, so that's what I'll be doing. I've never made a sauce for mushrooms but I am going to try. A little butter, a little flour, a little cream to finish? What could go wrong? Right? Lore, I make a homemade mushroom cream to have with my shrimp and grits. I slice the mushrooms thin (I like shitake & portobello) and brown them in butter. I take half out and reserve and add some shallots or onions, sprigs of fresh thyme & tarragon and half & half and let it simmer away, adding a bit of chicken broth if it needs the moisture. Then I strain the solids out ~ figure after 30 minutes or so the mushrooms have given up all their flavor to the cream ~ and then pour the sauce over the reserved mushrooms for that strong mushroom flavor. Mmmmmm! I got up this morning and it was cool....in the low 40's. 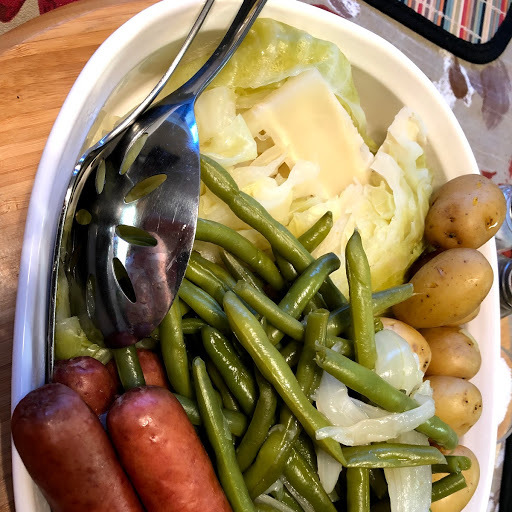 I knew I wanted a New England Boiled Dinner, or at least what my mother called the meal. I really don't think it has anything to do with New England but that's what we call it, or else we'll say it's simply a 'boiled dinner'. 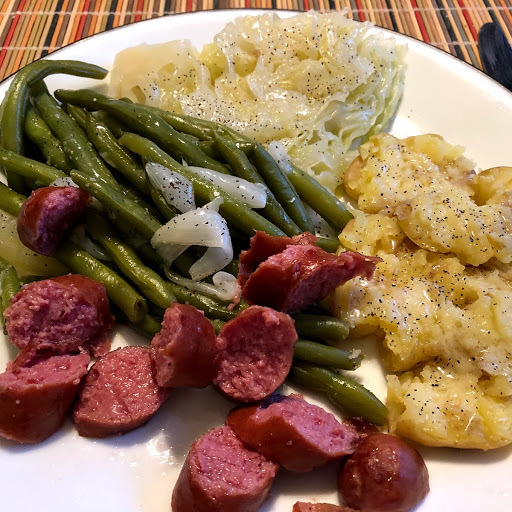 Smoked sausage or ham chunks simmered with potatoes, green beans, onions & cabbage. And to my credit, when I mentioned what we were having to Dane he was thrilled. He said he'd been getting hungry for the meal for a few days......funny how cooler temperatures can shape what you're in the mood to eat. The little bitty yellow potatoes are SO, SO yummy. Norm, Velveeta WAS the cheese everyone ate in the 1950 - 60's. Even though I didn't eat it I still had to slice it to make grilled cheese sandwiches for my brothers. I gotta say, it sure did slice easily with that cheese slicer with the roller and wire......and it melted quickly in the sandwiches. The American cheese slices.....that all stuck together because they didn't come individually wrapped at that time, were only a once-in-a-while purchase. At Christmas there would be a hunk of cheddar cut from the gigantic wheel of cheese that was a promotional deal at a downtown Toledo department store.....I think it weighed a ton and they made a huge deal about it being "imported" from Wisconsin on a lake freighter across the Great Lakes. I was in the Army in Germany in the late '60s and went on leave to Paris. In a restaurant, I ordered a grilled ham and cheese sandwich. The waiter asked me what kind of cheese I wanted and I didn't know there was any other kind than Kraft. I asked for American cheese and he looked puzzled and brought the sandwich with cheddar on it. I made a beef stew for us. Beef chuck cubes were super lean and tender. Tina likes scrambled eggs with a slice of american Land O Lakes cheese. She pinches off little pieces of the cheese and scrambles it all soft and fluffy. She likes ketchup on it. I will put Tabasco hot sauce on it sometimes. I like my eggs scrambled hard and browned. Actually, there are many different ways to fry / scramble / or cook eggs. Tina eats her soft boiled eggs on little pieces of bread that she puts in a bowl first, then she scoops the eggs out of the shells on top of the bread pieces. NormM wrote: I was in the Army in Germany in the late '60s and went on leave to Paris. In a restaurant, I ordered a grilled ham and cheese sandwich. The waiter asked me what kind of cheese I wanted and I didn't know there was any other kind than Kraft. I asked for American cheese and he looked puzzled and brought the sandwich with cheddar on it. I didn't know for half my life that there was parmesan cheese that didn't come in a green can. Katie had a runny poached egg on toast that she chops into a fine mince all over the top of the bread. That is how her grandfather ate his and she does the same. I chop my semi-soft poached egg into chunks and let it swim in melted butter. What I don't like is a fried egg with frizzled edges. I can't chew it. Yang Yang. I made a casserole of tortellini, chicken, broccoli in a parmesan-mozzarella cream sauce baked with more mozzarella on top. It was good. One of my favorite ways to eat a poached egg is to put it on top of a piece of sausage that is on top of some buttered toast. Sometimes I put jam on the toast too. Had a late lunch with his golf group......so no supper needed. 301 Re: Welcome November what's cooking!